This is one of those super-easy recipes that my Mom made for me growing up and now I make for my children. I am not exactly sure where it came from, but I bet it was from a box of Jell-O or on the back of box of graham crackers! They're so good and so simple to make - and a pleasure to create with kids. In a medium mixing bowl, blend milk with peanut butter until smooth. Add pudding mix and beat on low speed until well blended (about 2 minutes). Let mixture stand for 5 minutes. 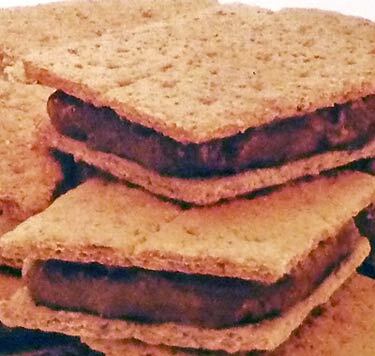 Spread peanut butter pudding mixture (about 1/2-inch thick) on 12 of the crackers. Top with the remaining crackers and press lightly. Using a small spatula, smooth excess pudding from the edges. Freeze sandwiches until firm (about 3 hours). If you plan to store sandwiches, wrap individually and freeze. Makes a perfect after school snack.